Just as Comic Con is starting Black Swan has told us about an interesting web site that has appeared. The Lost University can be viewed at http://www.lostuniversity.org/. This appears to be a marketing site more than an ARG, but it has a few elements that suggest it could be a bit more interactive. The biggest giveaway that this is more of a marketing site is that the ABC banner is shown above and below the site (not shown in the pictures above and below). A world of knowledge awaits you here at LOST University! As a student at LOST University, you will have the opportunity to dig deeper into the themes and mysteries of LOST, while at the same time exploring fascinating topics and subjects that relate to the world you live in. Enrollment for the first semester of LOST University will be open to all students beginning September 22nd, 2009. At that time, you will take a placement exam and be given a Student ID, as well as be able to watch your LOST University introductory class, LOST 101. Semester 1 begins on December 8, 2009, at which point you will be able to choose and enroll in all of your classes, as you build credits toward Semester 2 and graduation. In the meantime, feel free to browse the online course catalog and get a head start with some of your recommended reading. 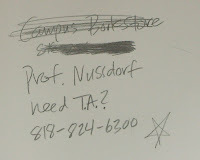 At Comic Con a flyer has been handed out with the information about the Lost University, on the back of each flyer is a hand written note about a Professor Nussdorf and it has a phone number. When the number is called a recorded message says the professor is unavailable until 22nd of September. In the video on the main page one of the professors sitting under the tree looks like Gerald DeGroot, judge for yourself with these two pictures. Thanks to BlackSwan for the information. As has been reported by many people now, there is an extra news item that is not yet published to the main site. Modify one of the existing news URL's to http://www.lostuniversity.org/news.php?article=5 and a news item saying "Campus Health Center Update - Anti-Radiation pills will be given to all students free of cost, but only through next Thursday. You can pick up your pills at the Shephard Clinic between 9 a.m. and 4 p.m."
There's a phone number on the back of a card they handed out about this at Comic Con. The ODI posted it on the front of Dark UFO. The number tells you the Prof. is out of town until 9/22. Maybe Maven and Scoutpost can pick one up. Here's the back of that card. And here's the front. Only had a minute to poke around. Professors listed can be googled. Stephen Finlay sent me to Blackwell Compass. Also anagrammed a few name, one came back as Evil Crook. Just no time today to play. I'll check back to see what else you all everybody found. My guess is DVD release promotion. Very interesting, I've updated the post with the phone number, and put a link to Dark UFO. Lottery Ticket - Talking of anagrams Nussdorf has the names FORDs and SUN in it. I'm not sure what to think yet, and I'll be disappointed if it's just a dvd release promo. At this point, it's just fun that SOMETHING new is out there! I have a feeling that it will be a promo for the DVD and then a run in to the new (last, sniff) series. I see what you mean, I've put another update on the post with a comparison photo. Semester 1 begins on December 8, 2009. Pick up LOST: THE COMPLETE FIFTH SEASON on Blu-rayTM Hi-Def, complete enrollment, and personalize your course schedule as you build credits toward Semester 2... and ultimately, graduation. So, it's mostly a marketing stunt for the DVDs. But who cares! The "Smokey Patrol" recruits at the DeGroot Student Center, room 324. Good call on the season 1 promo shot at the bottom, melissa! Here's the the background image. OMG, you don't suppose they're telling us that the reset shown in season 6 will be about our Losties ending up all going to the same college?! ROFL! Thanks Zort and everyone, great work! Heheh, yeah, Smokey is campus and dorm security. Capcom, I don't have that capability either, so I hope it's more than just that. Under the Lamp Post section where it tells you news tidbits you can manually change the last number of the article to 5 "http://www.lostuniversity.org/news.php?article=5". Anti-Radiation pills will be given to all students free of cost, but only through next Thursday. You can pick up your pills at the Shephard Clinic between 9 a.m. and 4 p.m. But I'm you and Black Swan Capcom. If it's all about Blu-ray then that leaves me out. It annoys me when they put extra/different content on the blu-ray discs. Black Swan said: " OMG, you don't suppose they're telling us that the reset shown in season 6 will be about our Losties ending up all going to the same college?!" memphish.. ROFL!! yep, that's what I have envisioned! Can't wait to see Sawyer in a LU t-shirt! LOL! So Locke will be the Dorm Father like Bob Golic in Saved By the Bell:The College Years. Kate will be the one to have an inappropriate crush on her professor played by Roger Linus. Jack and Sawyer will still want Kate but will settle for Juliet and some new girl they put on the show because we're out of girls once again. Sun and Jin will be exchange students. Hurley will play the Screech role. I put on my myspace status that I'm signed up for Lost University majoring in Philosophy with an "I'm right, You're Wrong" minor. LOL! I like the classes that have the note at the bottom about the course having no homework or exams. Where were those classes when I was in college? Yeah Blacky, Ice Bears are a Knoxville team, too late. Right, I'd have done a lot better in Physics class if there were no tests! And, if Danny was my teacher. I'd have "love" "you" written on my eyelids like that chick in Indiana Jones. I didn't mind homework, but I hated exams!!! Final exams would always bring my grades down! LOL! lol, capcom... I'd forgotten about that part in Indiana Jones! Seriously, I think the fact that they show the DeGroots and have Daniel Faraday as a physics professor means that in season 6 we will see a bit into the beginnings of Dharma and what Daniel did in the time he was in Ann Arbor. That would be so great Blacky, I've been hoping for that too. Some peeps have been wondering a lot if we'll see some Ann Arbor action in S6, in FBs or whatever. I actually lived in Ann Arbor a long time ago (but that was after I graduated MSU, not UofM) I was a 'stranger in a strange land' and 'walked among them but was not one of them', wearing my green in the land of 'Go Blue!' LOL! Yes, but I mind it interesting that it's not physics with Daniel Faraday - it's physics with Jeremy Davies. Greg at Eye-M-Sick said that Jack Bender is supposed to teach art, how awesome is that? I haven't even roamed around campus yet, I'll have to do that tonight. Hello there everybody!!! Hope we all have homeroom together!! For LOST Ice Bears isn't really appropriate though is it? Shouldn't it be Tropical Bears or Palm Bears or since the Island moves, the All-Weather Bears or Fair and Foul Weather Bears or given the Island the Rain Bears. Hey, gang...I'm here at the hotel awaiting Scoutpost! I've seen the Lost University stuff and we'll keep our eyes open for anything relating to it. Should be at Comic Con around 3ish. Hope this LU thing is a little more than a DVD promotion! Hi Maven!! Glad you got there safe! Don't forget to pick up a bunch of those Lost University flyers so you can hand them out to us later.. LOL! bloody hell i o to work for eight hours and its all kicking off again woo hoo!!!!!! I've been playing around with the blog logo and colours as they haven't changed for some time. Hope they aren't too horrid. love it zort. keep up the good work. sorry to mention this if this has already been posted but theres a still right at the end of the opening video of the crash site on the beach you can see the planes wheels stickin up in the air!!!! bit hard to see cos the uni logo is right over the front of it but its definatly the crash on the beach!!!!!!!!! yeah it looks like its in a cinema or lecture theatre! Lookin' good Zort! Yeah, the front page doesn't need to reflect the Ajira colors and design anymore. Has anyone signed up for the mailing list as a prospective student yet? I signed up! Didn't get anything yet. You? Hi, gang: Scoutpost and I are exhausted...and that's just from walking around the exhibit hall! We did get our Ben bobble heads. Didn't see anything about LU. Tomorrow will try to get in some panels...lines are unbelievable! Intrancer, yes I spotted that as well. ARG or not it is something extra to think about while we wait. It is more than likely just a big marketing ploy to get us all riled up and promote the season finale' and the DVD sales. But I seriously hope not! Nice new touches to the blog too! I'm thinking the site is going to have something to do with extra content on the season 5 blu-ray dvds. If that's the case then I'm not going to be able to be a part of it. But I'll check in here to see what it's all about. Yes, if it's all for the Blue-ray peeps, I'm SOL also. Hopefully someone will post it online like DarkUFO ODI, etc., have in the past, for those of us who don't qualify. Hopefully there will at least be some online activities for the interim as well. I'm glad you found that Black Swan. I saw it on Facebook yesterday, but didn't know where it came from. ABC's LOST site is not the more easily navigable. I had to ask someone to know where it was, myself! (a friend of mine at myspace who started their own little 'Lost University' before this ARG stuff came up. LOL!) Found it here first. btw, the front page of LostARGs looks great!! I was curious if this really was a short lived series of the 80's or an ABC marketing ploy. So I did a search on IMDB which I know isn't always reliable. But here's what I got. When I searched under all this is what I got. When I searched under TV episodes I got this. I found it interesting the Comic Con banner was in both searches. I thought maybe it was because it was comic con week so I searched something else and it wasn't in that search. Well, here we go. Seems to have imbedded image just past bird on shoulder. Are they going all alien on us? Who's talking at the beginning and what is he saying? crowd shot, stonehenge, cabin with tree, map, red dots on map, book with blank pages, color, bird, ?, imbedded message, spiral eyes, alien, crowd shot, moon, shadow, swaying slo-mo palms, DHARMA, documents (can't read, photos, news articles), book with writing, puzzle piece white to black. I just tried my links and noticed the second on no longer has a comic con banner. LOL Well now it's back. Sayid'sgirl: following your link, cast lists "Annie Baudouin de Cortenay" with no role, links only to Switchback band singing Nancy Whiskey and a model named Maxine Sue Elshiemer at Dar's Place in Waukon, IA. go figure. Yeah I'm thinking it's an ABC thing made for Lost fans. I couldn't find any short lived series from the '80s. Just the NOVA dvd of Mysteries of the Universe and it was in 1998. I'd say this is definitely for Lost fans. The fact that it just happened to be on ABC, the use of the phrase "they walk among us, but are not one of us," and the fact that in the map of secret organizations, one of the first red dots is right on top of Ann Arbor, MI is enough for me! So's the Lost University site. I wonder what we'll get from the Lost panel Saturday? Jorge's supposed to be there. I know he's in San Diego. I wish, wish, wish Elizabeth Mitchell and Dominic Monaghan who also have been there would also be there. I'd settle just for Elizabeth Mitchell. I'm guessing Michael Emerson will be the surprise guest though. He's following his wife around this summer, and I think she's in something that might be at ComicCon too. Oh well, at least it's something to play with for the mean time. These little things just add to the mythos of the show to me...but I was hoping for a true ARG. I'm having trouble trying to post. 7) Question regarding Richard Flashback!! I can't wait to see ths! Yay!! I want a Richard Flashback.. I think he figures huge in the whole story and I'm glad to hear this! Anybody out here found any videos of the panel yet?!? Very exciting day today, Losties! I've read one blow by blow of the panel. Good catch on DeGroot in the Lost U promo video! No one's mentioned it but it may have been obvious that the person facing the blackboard with the pony tail at the end of the video was Daniel Faraday. hi twinkle! I don't think it was obvious about the person facing the blackboard.. I thought it was a girl because of the hair, but I just looked again and it's a man's arm and hand.. lol! Good call! I'm not sure what we want to do about the Comic Con panel vis a vis spoilers. Maybe Melissa_Lossa could make a Comic Con post over at TLC or we could make one here where we could discuss what happened and those who want to avoid can avoid. If you want to see some of what happened at the panel, here's the Oceanic Ad that aired. Here's the Mr. Cluck's ad. Here's a Nestor Carbonell interview. Audio is not great. Swan: I thought it was a girl the first time too, and then I thought, "Nah! It should be Faraday." I remebered when Faraday had his hair like this. Lo and behold on second watching, I saw the hand. Memphish: Thanks for the video links! I have modified the post over at TLC to warn about comic con spoilers - so go ahead and post any discussions over there. Those avoiding spoilers have been warned. Hi all! I did get one of those flyers that had the pencil note on the back. Also got a LU pencil handed out at the LOST panel. I did talk to the guy who is running the LOST auction in May. That's where they were handing out the LU flyers. He did say that he knew it will be a "real" on-line university talking about subjects relating to LOST, but it is not a game! Boohoo, it's all over and no new mystery video like before, right? I was hoping that they'd find some strange archeological thingy that Charlotte found and stashed while she was on her dig. Or, something equally as ridiculous. Well there was that Mysteries of the Universe thing Capcom. I think that's all the mysteries we're going to get except for speculating on what those commercials meant. Yeah, what did that mean, anyone onto something with that yet? I'm not being pushy honest, I just didn't get to check back online all day until this evening so I don't know if I missed anything happening on the other sites with that. Any speculation anywhere? P.S. One idea that I saw "bandied about" is how the Oceanic stewardess says that the airlines has a perfect flight record, or something to that effect, so does that mean that the commercial is made in another timeline where 815 didn't crash? Don't throw tomatoes at me, I'm just passing it on. But what the heck, like the entire world doesn't know about the O-6 and their crash now? Something's weird about that. Or, the bomb-incident-reset actually worked, and 815 didn't crash. WTH. Capcom: That's what I thought. Hurley makes it to LA and is happy being CEO. Kate runs again and is still wanted. And there was no crash to mar Oceanic's perfect record. The bomb did reset time and 815 didn't crash, but goes on to LA as planned. Maven, Scoutpost, I've been reading all about your Lost panel experience on the Comic Con blog and I'm so jealous ! Can you send a picture of the pencil ? Here's Kate on America's Most Wanted. Seems to me all the videos were saying that Jack's plan did work at least as far the 815ers go. Oceanic is saying, 1st of all that it's 2009 and that they've never had a plane crash in 30 years. Hurley's Mr. Cluck's apparently was never struck by a meteorite and while he did indeed travel to Australia he returned safely and created this Australian inspired meal that costs $4.42. Who's scared of the numbers now? And Kate has still tried to kill her dad, but not by blowing up her mother's house. Instead she blew up (with a cut gas line again) his plumbing office which killed one of Wayne's employees. So Kate is basically where she was before 9/20/04 or so, i.e., on the run for murder and probably with the Marshal chasing her. The other really interesting thing was the logo for the season. You can see it here. It starts out with those Losties we knew as of S5 were alive and then adds back in those who have died. Maven made Pop Candy again! JOpnionated posted the In Memoriam video. It's Part 6. It said Libby's last name was "Smith" and Karl's last name was "Martin." It also made me tear up. @Zort: I posted the LU pencil pic on our blog. There are hieroglyphs on the print LOST/Kia ad that ran in Entertainment Weekly (they are on the film canister)-- could this have something to do with Prof. Nussdorf? Suddenly an unknown person is dropping us clues? Yes, that is either a kick in the right direction from someone on the inside or a contributor with lots of insight ! Regardless, I have created a NEW POST ! I also found the password message, as well as another menu that appears to be extensions for the actual company that is running the ARG. Any ideas? Any luck with the password? I tried the obvious ones without success.